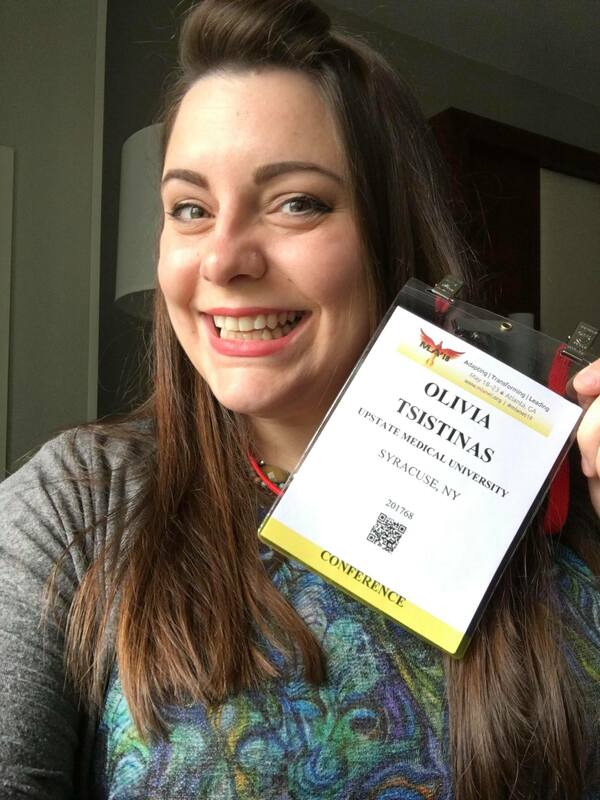 UNYOC Professional Development Award winner Olivia Tsistinas talks about her experience at the MLA Annual Meeting in Atlanta below. Olivia with her MLA badge! Thank you for supporting my first MLA through the UNYOC Professional Development Grant. 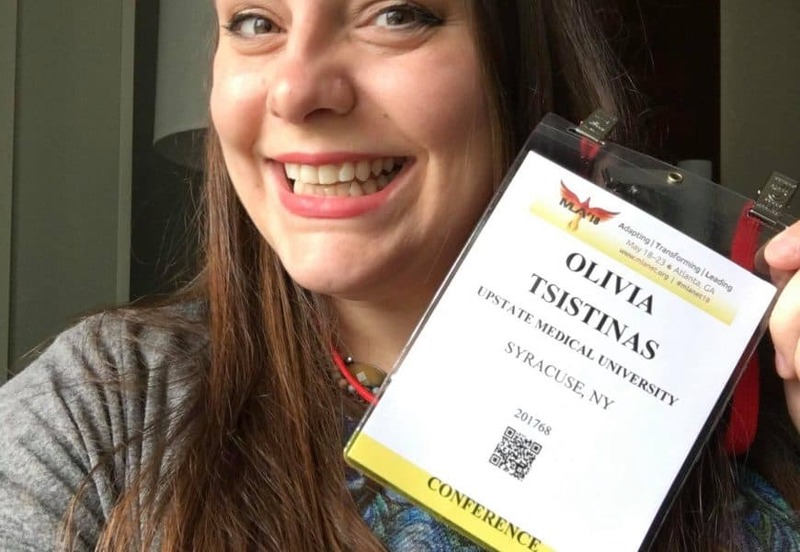 I learned so much while being immersed in the knowledge of my fellow medical librarians, and I’m excited to share that with you! 1) Early flights were superior to evening flights. If they are canceled you will still have an opportunity to get to your destination that day versus having to sleep in the airport. 2) Pacing yourself is vital. There are so many breakout sessions and it is impossible to see everything. Taking time to plan, rest, and hydrate will help you make the most of the meeting. 3) Seek better coffee. Hotel coffee could take the tarnish off a penny. Get up early to seek out the good stuff. 4) See the city. MLA picks great venues and you need to see what they have to tell you. I had the chance to see some touristy sites, and eat some great food. 5) Talk to strangers, eat with strangers, and laugh with strangers. I made some wonderful connections and had great conversations because I was willing to start the conversation. 1) Attend vendor sessions to say thank you and ask for more. I had already gotten to know our vendors from UNYOC. Now I had a chance to ask them to sponsor our chapter meeting next year and ask for support materials so I could help promote their resources to my customers. 2) New Member/First time attendee session was a great way to connect with people just as excited as I was! MLA told us that new members were the future of the organization. 3) The Janet Doe Lecture presented by Elaine R. Martin was inspiring! Her message about social justice and the medical librarian will propel me to engage in more robust outreach to our surrounding community. Giving people access to health information is an act of social justice! 4) Sign up for the lunch and learn sessions! I was really interested in a session for the content, but because I didn’t preregister I was shut out. Next time, I will connect with my colleague who manages our licenses so I can get the invitations! 5) Make a plan for what you want to see, but be ready to change your mind. It took a little getting used to, but with so much content going at the same time it was important to leave if the session didn’t meet your needs. 6) The final session by Dr. David Satcher reinforced the power of health information and put all that we do into perspective. Medical Librarians are making the world a healthier place! I’m looking forward to going back and getting more involved. I’ve got committees I want to join and projects I want to share. Thank you again for your support! UNYOC 2018 Annual Meeting Call for ParticipationSubmit your presentation proposal by 8/24!